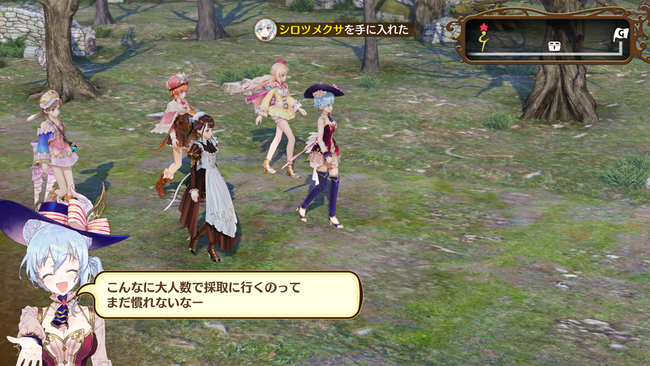 The Atelier series is indeed the longest running franchise owned by Gust. Even after it has become a subsidiary of Koei Tecmo, this RPG series continues to flourish with a new title coming out almost every year. 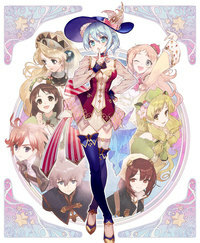 While its actual 20th anniversary was celebrated in 2017 with Atelier Lydie & Suelle as a proper RPG to close the latest trilogy, this time, Gust is finally branching off by creating Nelke & the Legendary Alchemists: Ateliers of the New World, a town-building spinoff that honors an important milestone by featuring characters from all prior mainline Atelier games. I was able to try out Nelke's demo build which was available at Koei Tecmo's booth in Tokyo Game Show 2018. The demo automatically ended after some minutes have passed, so I had to skip any conversations as to not miss gameplay segments. Luckily, the game does provide a button that does exactly that so I don't have to mash buttons to breeze through these sequences. The demo went like a tutorial session explaining the general game flow. A turn (likely referring to a week) consists of two phases: Weekday and Weekend. The Weekday phase is when Nelke and others do their respective jobs. Nelke can give orders to have facilities constructed at available slots; most of them should be finished by the following week. These facilities range from material-producing workplaces like farms to income-generating shops. Some facilities can be rotated as the player sees fit, but certain buildings like shops have to be positioned in such a way that the storefront is facing the street. 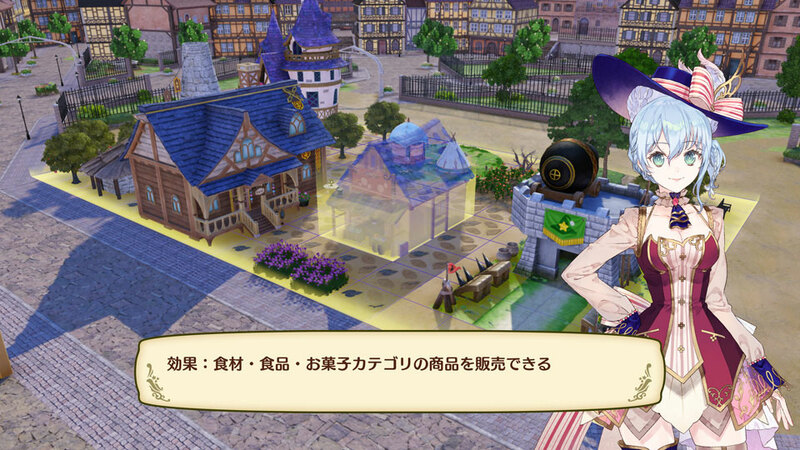 As unique characters come to dwell in the town, Nelke can assign them to manage shops and help sell items. Adventurers can even be ordered to go out on expeditions to outside fields in order to procure materials that cannot be found in town. Alchemists, in particular, can be assigned to a vacant atelier where Nelke can then make formal requests for them to produce items through alchemy. After Nelke has finished giving orders for the week, the game will move to the Weekend phase where she can visit other characters to interact with and improve relations between each other, or go on outside explorations with adventurers. For the latter feature, Nelke can spend some money to form contracts that enhance the explorable fields, from unlocking the fields themselves to improving the quantity and quality of items that can be obtained within. Field explorations are done in a very simple way. They simply consist of a linear path that the party must traverse through within the allocated time. Reaching the end of the path will allow the party to obtain more materials as treasure. You can also have the party run towards the destination to arrive there quicker, but you won't be able to pick up any materials during this time, and you also leave yourself vulnerable to enemy advantages in combat. Speaking of the battle system, the order of the acting units are basically determined by each unit icon moving along a single line, with the initiative usually determined by the speed stat of allies and enemies alike. As for the party characters, they can be categorized into two types: Alchemists and Non-Alchemists. This game's original characters such as Nelke von Lestamm, Misty Elrute, and Knoss are all non-alchemist fighters who attack with melee weapons and can choose which enemy will be attacked. 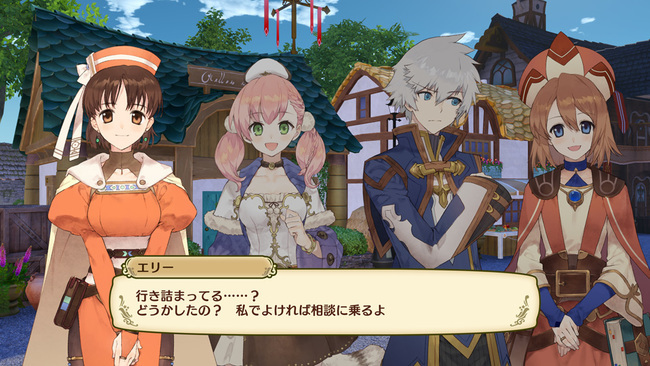 Alchemists like Marie and Elie will instead automatically attack enemies when their turns come up, but you can also opt to have them use powerful skills. In lieu of an MP gauge, party members will use Drive points which replenish each time they have taken a turn; some characters can have a maximum of 5 Drive points. There is also a Burst gauge to the left of the battle screen which is filled collectively by the whole party. When full, a Burst mode can be activated which will strengthen all party characters while giving a Drive point to each of them. When battles have been won, I noticed that there are no experience or level gains - the party just gains more material drops instead. At the end of each week, the game will calculate the number of contributions made by each unique character. The one who contributed the most in the week will get the MVP title, which also improves his or her relationship with Nelke. The game also analyzes the production and market chains of the town and will point out factors that should be improved in order to maximize profit. For example, the amount of manpower, facilities, or materials. By the way, I got to play the docked Nintendo Switch version when I checked this title. There was also a PlayStation 4 build of the demo, and based on what I saw from that version, I didn't notice much of a difference in model detail or texture quality, although the PS4 version definitely has an advantage on the frame rate. After playing the demo, Nelke & the Legendary Alchemists appears to provide a casual fun factor in town management with the characters from the Atelier series. However, I feel like the gameplay systems - especially on the exploration and battles - may come off as too simple that they could have made a mobile game with the exact same mechanics. I am particularly concerned with the Weekend phase menu as it uses still images instead of thoroughly animated scenes when showcasing Nelke's leisure activities like fishing and performing music. But after all, since this title is intended as a celebration to mark the 20th anniversary of Atelier series, the most important factor by fans should be the crossover interactions between the different characters. This is especially true considering every single character that appears in this game has been re-designed by NOCO, whose superb drawings have turned them all into pretty girls and handsome men. 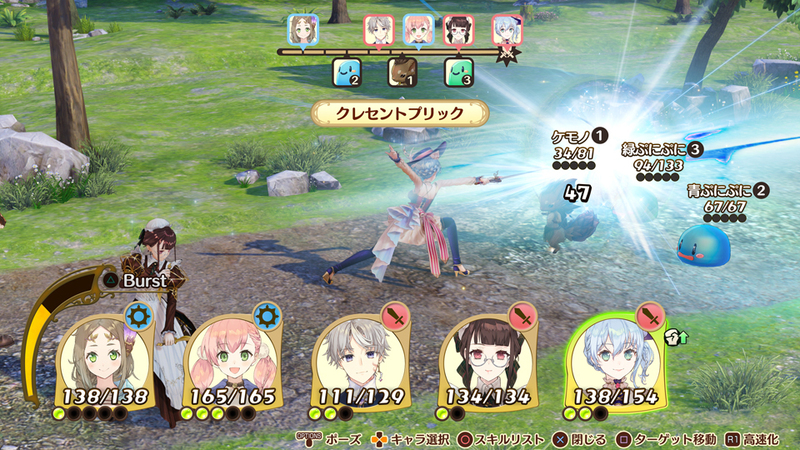 That will be the point to watch as Nelke & the Legendary Alchemists: Ateliers of the New World is gearing up for its release in Japan on December 13, with the Western localization also slated for release later this Winter.